For the past five years, Ceony had wanted to be a Smelter. In an alternate version of Britain, magic exists. Magicians bind to man-made materials to channel their magic. Ceony Twill, graduate of the Targis Praff School for the Magically Inclined, is assigned against her will to apprentice under a paper magician, a magic she finds boring. Apprenticed to Emery Thane, an eccentric young magician, she learns the art of Folding – bespelling paper. When an Excisioner, a practitioner of the dark art of flesh magic, rips out Thane’s heart, Ceony embarks on a quest to find it and get it back – before time runs out and Thane dies. Ceony Twill is a very likeable main character. She is determined, she is snarky, she opens her mouth when she doesn’t like something. But she is also smart and knows when it is better to stop side comments. And above all, she is curious. This is not a heroine that just drifts along, waiting for things to happen to her. Weird rooms in a weird house? She will definitely look into them. People talking in whispers, maybe about her? How about a little eavesdropping? For she knew no one else would. Besides Ceony, there is also Emery Thane, eccentric paper magician and her teacher. I liked Emery a lot. He is incredibly sweet. He greets guests with a paper skeleton, yes, but he also creates paper snow inside the house to show Ceony the beauty of paper magic. And when he learns that she had to leave her dog behind because of her allergies, he creates one out of paper for her. One can really understand why Ceony could fall for Emery Thane. He is sweet, considerate and respectful. I liked the relationship between the two. There is not a lot of romance in the book overall, which is good. The two respect each other and slowly grow to like each other. There is no insta-love or insta-lust. Ceony’s heart skipped a beat and she whirled around, slamming her suitcase shut to hide her underthings and gun. Mg. Thane stood in the doorway, not yet breaching the threshold into her bedroom, holding a rather large stack of books. She should have closed that door. Another thing I really liked about this book is the magic system. It is different and interesting. Magicians bond to a certain material and can afterwards only do magic with that material. The material has to be man-made, so we have paper, glass, metall and plastic. There is also dark magic, magicians that bind themselves to human flesh (since man is man-made). Once bound, however, the magic goes far beyond what one first imagines. I really like the descriptions of paper magic, the origami creatures brought to live, the story illusions and especially Fennel the dog. To her amazement, snow began to fall. Paper snowflakes cascaded through the air, some as small as Ceony’s thumbnail. some as large as her hand. Hundreds of them poured down as the paper ceiling gave way, all somehow timed just right so that they fell like real snow. Unfortunately, despite its many good sides, the book starts to drag in the middle. Once Ceony is captured inside Thane’s heart, she walks through his memories, hopes and fears. This part consists mainly of her walking through flashbacks of Thane’s life, one after the other after the other. The threat of the Excisioner following her and finding her in the heart is not enough to make the flashbacks exciting. Also, in this part I had the feeling that Ceony lost a bit of her own agenda and it’s all about Thane. The thought of Thane gets her onward, not her own volition to help him. For a split second, she felt herself paralyzed, but the whispered beating of Emery’s heart regrounded her. Forced her to move. Furthermore, the book goes overboard with descriptions, both of people and places. I didn’t mind it that much in the beginning, when we get to know the characters. She was stunning – tall with long, waving hair such a dark brown it looked almost black, coffee-colored eyes, and fair skin without the slightest trace of freckles. She wore a black shirt well fitted to her rather ample figure, tight pants with panels over the knees and two-inch gray heels that fastened with two cords around her ankles. However later, during what should be action scenes, there is a bit too much unimportant description. Do we really need to know the colour of the origami birds in the middle of an action scene? She stiffened, but seven square-bodied cranes heeded her command and sprung to life in front of her – orange, yellow, maroon, white, white, white, and gray. 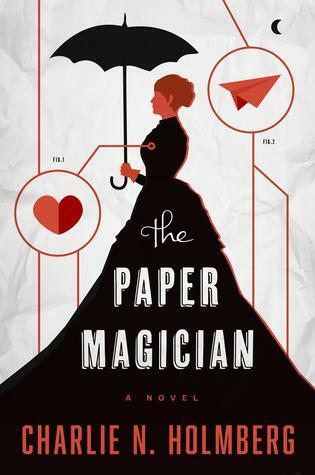 The Paper Magician is a sweet read. Despite dragging in the middle, it takes place in an interesting world with very likeable characters. At just a little over 200 pages it is a quick and fun read. It is the author’s debut novel, so I will probably check out the other books in the series. I liked the world and the characters and there is a lot of potential.